Today is the third day of Bangladesh Plein Air and the third day of summer camp in Eastern school, which is very interesting and exciting. All the children are having fun, they are swimming, doing exercises. drawing. They also learn songs by Komitas. 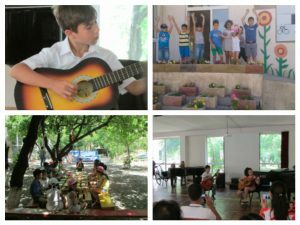 Today our learners` Vram and Arthur played the guitar in the Music Festival. They really did their best. Today we continued the discussions of the presentations of the transnational review. We chose some of them. The participants of summer camp are also trying to clean, to make beautiful our environment , our school. Previous story А у нас с окна красота! А у вас?